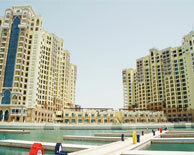 Marina Residences is a residential complex of six towers boasting stunning panoramic views of the sea and coastline. Situated at the tip of the Palm Jumeirah island, Marina Residences rise up from landscaped podiums to form a V shape maximizing the sea views. The Marina Residences architecture, with its arabesque forms and colors represents the region and brings a traditional elegance to the modern, stylish and technologically advanced apartments. Each tower has one of Dubai’s largest marinas at its doorstep with berths for 700 boats. Access to outstanding leisure and entertainment facilities awaits residents of the building.